How Can Students Gain Leaderboard Points? 3 teachers from each state, with the highest points in the National Leaderboard will be shortlisted to submit their stories! Winners will be based on their slide submissions. A presentation is not required. How Can TEACHERS Gain Leaderboard Points? 3 schools from each state with the highest points in the National Leaderboard will be shortlisted to submit their stories! Only 10 schools will be invited to present their story in front of a panel of judges. Winners are judges based on their submissions and presentation. How Can SCHOOLS Gain Leaderboard Points? The sum of points is divided by the number of participating students and teachers so that school size does not provide an advantage or disadvantage. Note: Because this number is constantly changing, the Leaderboard points may appear to fluctuate. How Can Schools Increase their Chances of Winning? So that students can do as many quizzes as they can + And achieve the highest average score as they can! Let’s look at a few scenarios! A school wants to achieve a high average score for Maths quickly and easily, so they have an idea to select 20 of their best students to do quizzes, and get a high score. Because this school only has 20 students in the Championships, those 20 students can only complete a certain number of quiz questions - their average score is high, but they lose out on points for no. of quizzes. School is unlikely to win, and will lose to a school who has spread good learning practices to a higher number of students. A school wants to gain points by getting as many students and teachers participating as possible, so everyone is asked to do quizzes to rack up points. Because a large number of users are only doing quizzes without learning from them, their average score for Math is low. 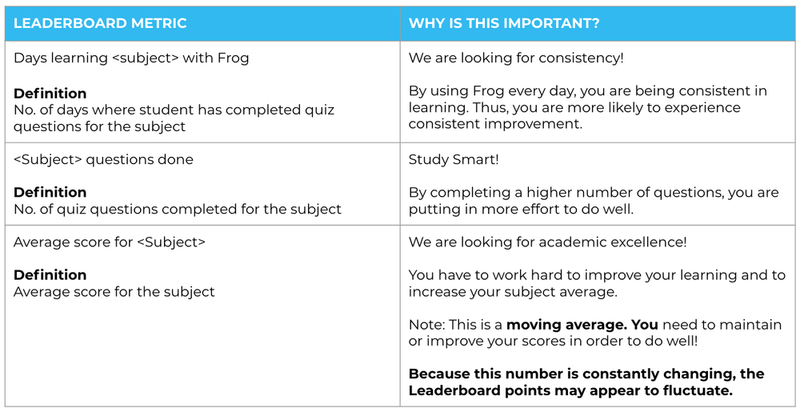 The school gains points for number of users using Frog, but loses out on the points for achievement. School is unlikely to win, and will lose to a school who has worked hard to increase their scores and maintain the number of participating students. School gets as many students and teachers to join as possible, by implementing best practices and encouraging students to learn and improve as they go. In the beginning, 20 students join the Championships and get an average score of 40% for Maths, but gradually increase it to 60% after 1 week. The next week, another 20 students join the Championships. 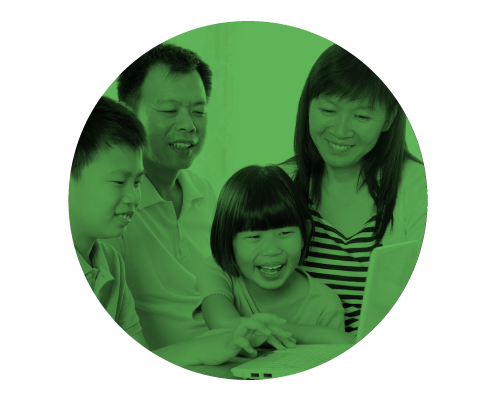 As the new students are just beginning to learn with Frog, they initially have lower average scores; this brings the total average down to 50%. These new students then keep practicing, and work hard to increase their score; at the end of the week, the average is brought up to 70%. Two things have changed here (1) the total number of participating users and (2) average score. Therefore, the points appear to fluctuate, but with enough time and proper practice, the total average should increase! The school has gained points for participation, effort and achievement, and will likely be the winner of the Championships!